How to buy the Best Gas Smoker? A gas smoker enables owners to take their backyard parties to the next level. Smokers are capable of grilling large batches of meat, fish, and veggies with minimal or no supervision at all, giving the party host ample time to mingle with his guests rather than spending time tending to the grill and getting smoked himself. Gas smokers can be set up and left to tend on its own because you can set the timer and the temperature. Unlike gas grills that you have to constantly check, just in case you’re burning the meat too much. As a result, smokers avoid grilling the meat too much (overcooked, dry, or burnt) or too less (undercooked or raw). The grilled goodies give your party and guests more reasons to enjoy the party. If this is your first time to buy a smoker of you’re planning to replace an old one, make sure to read through this article to know what to look for when you buy your gas smoker. All factors that should be considered will be listed, to give you an insight for decision-making. 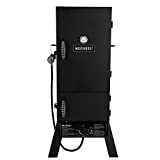 What to look for in a gas smoker? 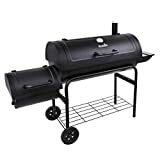 In order for you to get the best gas smoker there is, we have listed some factors about the suitable gas smoker for you and some recommendation. Remember, just because a gas smoker is deemed as the best there is means that it will be the best for you too. Everyone has different needs and preferences, so it’s up to you to decide which one is the best gas smoker. Be wary though of the cheap ones as they might be refurbished ones that customers returned due to problems and were just fixed. Refurbished are definitely cheaper but it poses some risks. However, if the seller promises to take full responsibility, gives good warranty, and would take the product back in case you changed your mind or encountered problems, it’s probably worth trying it. Who knows, you might get lucky. As the saying goes, one man’s trash is another man’s treasure. Meanwhile, gas smokers that go beyond $500 are deemed luxurious. Keep in mind to go over the quality of the overall product, the material used, the capacity, etc. Also read reviews about the product you’re eyeing. You don’t really have to spend so much for the sake of practicality. Fuel: Gas smokers mostly come in propane fuel (the tanks don’t come with the product). Although propane tank is considered as cheap in some areas, it may be a hassle to refill and/or replace it every time it runs out as you have to run to your nearby utility station. It’s also difficult to know how much fuel you have left so most owners take their tanks for refills although it’s not fully used up yet. For this, barbecue junkies who use gas tanks have found a way to not be shortchanged. Purchase a grill gauge to use for weighing propane tanks. An empty tank weight five pounds, and a full one is 20 pounds. It’s also worth mentioning that since your gas grill runs through propane tanks, you should get a backup tank just in case you’ll need it. This is advisable if you’re having a big party and the smoker is the main source of party food. There’s also a way to avoid using propane tanks and skip all the hassle. This is to connect your smoker to your existing natural gas line. Doing this will also cut costs because natural gas is cheaper than propane. Not all gas smokers come natural gas ready though so you have to seek the help of a professional to set up your smoker to the gas line. It may cost you a bit depending on the distance of the smoker to the nearest line. Size: Gas smokers come in many sizes and shapes. Decide if you want to get a big one or a small to medium sized one. Naturally, big ones will consume more fuel but this will enable you to cook more meat and result to less batches. If you like throwing backyard parties a lot and invite two dozen people at a time, then a big smoker is worth getting as it can whip up a large amount of food in the littlest time. On the other hand, if you have backyard gatherings for your family and friends, a small to medium sized smoker will suffice. A small smoker can accommodate about 12 hungry stomachs, easily. Smokers are a fantastic addition to your backyard, patio, or outdoor kitchen because of its ability to produce mouth-watering dishes easily; you don’t have to be a top chef to own or operate one. It’s also easier to use compared to traditional grills because it doesn’t require your full attention. It’s able to work on its own and grill without you having to look over your shoulder all the time. 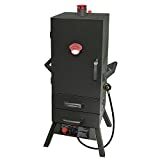 A gas smoker is also a good replacement for charcoal smoker or grills because it is able to retain the nice, smokey flavor charcoal smokers produce, without the cost of messy, high-maintenance cooking.